Chiron Review is in a 6×9, perfect bound, softcover format. Our ebook edition supports Kindle, iBooks, Nook and most other readers and devices. Poems by: Austin Alexis, Mark James Andrews, Michael Alleman, Shane Allison, Llori Bryant-Stein, Jesse Breite, Ruth Bavetta, Jennifer Jackson Berry, Wendy Cha, Sean Casey, Harry Calhoun, Rob Cook, Terry Chess, CH Cummings, Brian Daly, Robert Demaree, Fred Dale, Matt Dennison, John Dorsey, Jean Esteve, Greg Field, Peter J. Grieco, J. Todd Hawkins, Robin Dawn Hudechek, Meg Johnson, Robert Lee Kendrick, Michael Keshigian, John Kaniecki, Boris Kokotov, Brent Leake, Will Leadbetter, Michael Lauchlan, Maja Lukic, Harriet Levin, Keith Moul, Ronald Moran, Jennifer Martelli, Al Ortolani, Ashley Ruelas-Ruiz, Kevin Ridgeway, Russell Rowland, Dan Sicoli, Christine Swanberg, Anthony Seidman, Amir Adam Tarsha, D.D. Wood & Philip Wexler. Prose by: Stephen Barone, Derek Updegraff, Alexis Garcia, Iwona Partyka, Benjamin Norman Pierce & Sheila Thorne. 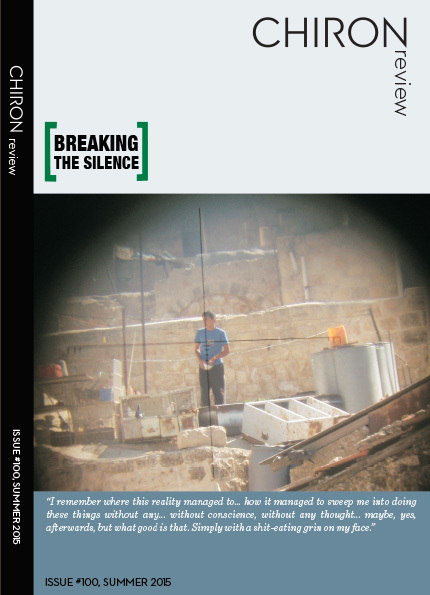 Anthony Lucero interviews Avner Gvaryahu of Breaking the Silence. Featuring photographs by Breaking the Silence and ActiveStills. Design by Craig Ashby. © 1982-2019 Chiron Review. All Rights Reserved.